Manufactured in Japan since 1985, the Global Classic collection has remained unchanged as a true testament to its quality and unique construction. This original collection designed by Komin Yamada promises durability, quality and timeless design that captures the spirit of Global's philosophy and insistence on excellence. 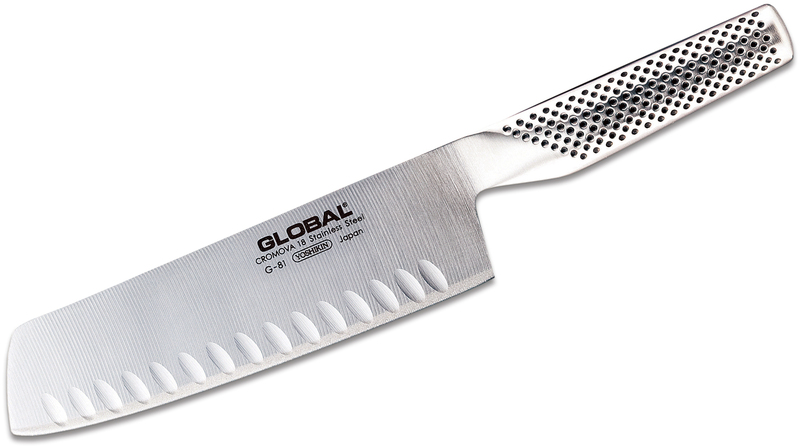 Also known as a Nakiri knife with hollow ground/granton edge, this knife is a Japanese-style knife that is great for chopping meat, root vegetables, and big prep jobs. 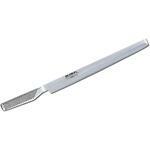 A popular alternative to the Santoku. 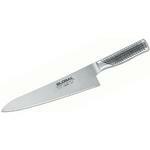 The scalloped grooves on the sides of the blade edge help with reducing friction and sticking of foods. Made in Japan. Made with hollow handles which are then filled with sand to achieve the desired weight and deliver the perfect balance. The blade is made of the finest stainless steel called CROMOVA 18 (Chromium, Molybdenum and Vanadium), designed exclusively for Global. Ice tempered and hardened to Rockwell C56 - C58 degrees which holds the razor-sharp edge of the blade longer than many other steels. 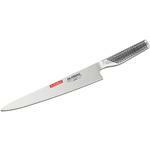 Hey, I wanted to share "Global Classic 7 inch Vegetable/Nakiri Knife, Hollow Ground" with you from KnifeCenter.